Easy Shrimp Tacos with Pineapple Chipotle Sauce ~ Made with saute shrimp, slaw, avocado, tomato-jalapeño salsa, and topped with a pineapple chipotle sauce. These shrimp tacos are a fast and flavorful weeknight dinner with a sweet and spicy kick. Seriously, what is not good about perfectly seasoned jumbo shrimp laying on a bed of slaw, avocado, tomato, and jalapeño salsa wrapped with warm corn tortillas and drizzled with a sweet and spicy pineapple-chipotle sauce? Doesn’t that just make your mouth water? What makes these tacos extra delicious? The incredible sauce. To make it, I mixed chipotle peppers in adobo sauce, mayo, lime juice and Dole Crushed Pineapple in a food processor until well combined. This sauce comes together in just about 2 minutes and I can already think of multiple dishes you can add it to and make them stand out! Made with saute shrimp, slaw, avocado, tomato- jalapeño salsa, and topped with a pineapple chipotle sauce. 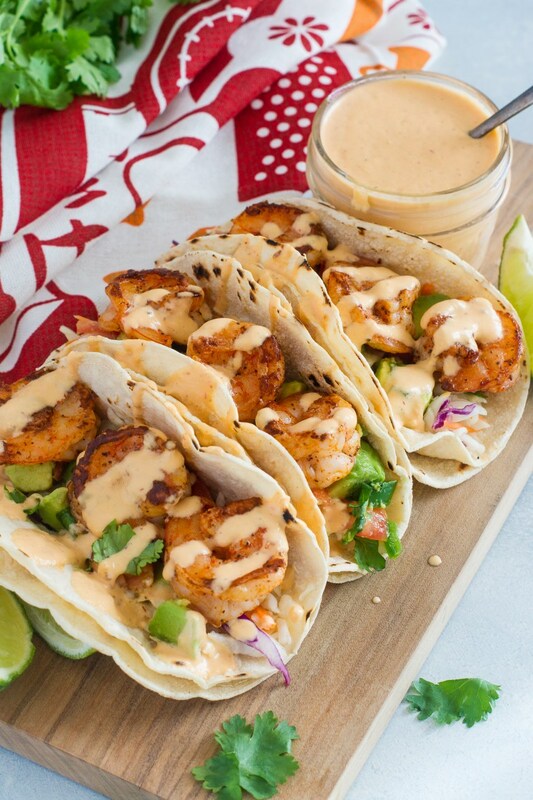 These shrimp tacos are a fast and flavorful weeknight dinner with a sweet and spicy kick. In a food processor, mix chipotle pepper, adobo sauce, pineapple, mayonnaise, 1 teaspoon lime juice and a pinch of salt until well combined. Set aside. Season shrimp with paprika, 1 teaspoon lime juice, salt and pepper. Heat oil in a frying pan and cook shrimp for about 3-4 minutes on each side. Remove from heat and set aside. Season slaw with 1 teaspoon lime juice, salt and pepper. Set aside. Mix together tomato, jalapeño, avocado, cilantro, 1 teaspoon lime juice, salt and pepper to taste. To build your tacos, layer slaw, tomato and avocado salsa over the tortilla. Top with shrimp and drizzle over the top with pineapple chipotle sauce. 0 Response to "EASY SHRIMP TACOS WITH PINEAPPLE CHIPOTLE SAUCE"